The High Court’s recent decisions in Barbaro v The Queen (2014) 253 CLR 58;  HCA 2; and Commonwealth v Director, Fair Work Building Industry Inspectorate (2015) 90 ALJR 113;  HCA 46; do not sit comfortably with Australia’s parallel criminal and civil cartel provisions in Pt IV of the Competition and Consumer Act 2010 (Cth). On the one hand, the Australian Competition and Consumer Commission is able to negotiate a settlement with a party to a cartel in civil penalty proceedings and then make application for a resolution order to give effect to the agreement. In such circumstances, it will be for the judge to decide whether the agreed civil penalty is appropriate in the circumstances and, if it is, a resolution order will be made. On the other hand, the Commonwealth Director of Public Prosecutions is impeded in reaching settlements with a party to a cartel – potentially for the same conduct – because, on a strict reading of Barbaro, it is unlawful for the Director to put to the judge a numerical statement on what the sentence should be. This article explores some of the bases for the distinction, considers some of the practical consequences of the distinction, and questions the underlying principles. Facilitating practices are prevalent in commerce. So are most favoured customer restraints. The effects of such practices and restraints can be pro-competitive or anticompetitive. They have come under increased scrutiny by competition regulators and commentators. Australian competition law is not well-equipped in this area. The provisions of the Competition and Consumer Act 2010 (Cth) relating to cartels, anticompetitive agreements, misuse of market power and resale price maintenance are prone in this context to undue overreach, underreach and uncertainty. Most of the flaws and gaps identified would not be remedied by adoption of the recommendations for amending the CCA made by the recent Harper Review. Responsive solutions are proposed. Since 1985 a Regulatory Impact Statement (RIS) has been mandatory for all Cabinet submissions and applies to every government agency operating under the PGPA Act 2013. This “systematic approach to critically assessing the positive and negative aspects of proposed and existing regulations and non-regulatory alternatives”, when supported by a cost/benefit analysis, is intended to mitigate unintended consequences and subsequent revisions needs. As Federal Government agencies, such as the Australian Prudential Regulation Authority, operate outside direct parliamentary oversight it also constitutes a protective mechanism against agency capture risk. Efficacy concerns arise, however, through extensive (bi-partisan) use of carve-outs, election promises and Prime Ministerial exemptions. 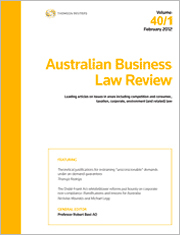 This article highlights the impact of non-adherence to the RIS process in three cases: establishment of the National Broadband Network, the introduction of the Registrable Superannuation Entity (RSE) licensing regime and the establishment of the Future of Financial Advice (FOFA) reforms – and considers more broadly the ramifications of discretionary by-pass provisions. For the PDF version of the table of contents, click here: Westlaw AU – ABLR Vol 44 No 5 Contents or here: Checkpoint – ABLR Vol 44 No 5 Contents.